But not all feet are so wonderfully miraculous. Some aren’t so pretty. Some are flat. And some are so extremely arched as to cause chronic problems. What’s pes cavus (aka high arches)? Women might prefer to have the sort of delicate, high arched feet that look good on dancers or in stocking ads. But there’s a potential downside to that look. More time is spent correcting flat feet rather than fixing feet with excessive arch. A significant segment of the population (estimates range from 8% to 15%) suffer from high arched feet, known as pes cavus, which sound more serious and significant when they are expressed in Latin. Pes means “foot”. And cavus translates simply as “hollow”. 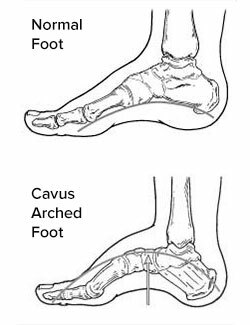 Indications of pes cavus include pain on the side of the foot, instability of the lateral ankle, and pain under the ball of the foot. Patients describe feeling as if they are falling over on the outside of the ankle. People with high arches often have recurrent ankle sprains. In severe cases, pes cavus can lead to stress fractures in the foot’s lateral column (the outside of the foot, between the toes and the ankle). Pes cavus may also cause hammertoes (severely bent toes) or claw toes (toes that are clenched like a fist). The abnormal posture may result in calluses on the ball side or heel of the foot. What causes pes cavus foot? Pes cavus foot can be congenital. It can result from a spontaneous deformity or a trauma that tears tendons or ligaments. It can also gradually develop in response to repetitive stress. Each (or a combination) of these causes results in a bio-mechanical imbalance. One muscle group dominates its counterparts, and the architecture of the foot is distorted into a cavus position. The diagnostic protocol for pes cavus begins with a review of the patient’s family history. An examination of the foot, looking for a high arch and the presence of calluses, hammertoes, and claw toes by the surgeon. The muscles of the foot are also tested for strength and the patient’s walking gait and balance are observed. The wear patterns on the soles of the patient’s shoes may also provide a clue. The foot’s interior context using Imaging techniques may reveal additional diagnosis. Charcot Marie Tooth syndrome, a form of muscular dystrophy that can weaken the foot muscles which would ordinarily prevent excessive arching, can complicate proper diagnosis and treatment of pes cavus. Conservative care is generally successful for mild to moderate cases of excessively arched feet. Custom-made orthotics can effectively counteract the imbalance that characterizes cases of pes cavus. Braces can help keep the foot and ankle stable. Bracing is also effective in alleviating the foot drop that sometimes accompanies pes cavus. Careful consideration of the precise cause for the cavus deformity is crucial in pre-surgery planning. Surgical techniques will vary for repair of a structural deformity or to repair excessive arching caused by trauma. First, the source of the deformity will be repaired. Then additional surgical procedures will be performed in order to permanently maintain the new arch. Each of these phases may include shortening, lengthening, or repositioning tendons, as well as cutting and repositioning bones. Installation of screws and wires is sometimes necessary to maintain stability. It’s important to keep weight off of feet and ankles for a significant time after a pes cavus surgery. The bones, tendons, and muscles of the feet and ankles have been cut, lengthened, stretched, and repositioned. Healing will require at least six weeks, and often more time is recommended. The final results won’t be fully appreciable until six months to a year after surgery. If you’re experiencing problems with your feet in any way, we’re here to help. Our nationally recognized foot and ankle specialists offer the most advanced podiatric care with the highest success rates in the nation. We are leaders in the research and treatment of all foot and ankle conditions.